Ancient pines in the mist near Cradle Mountain. This ultimate local’s, slow-burn north-east Tasmania roadtrip is number 83 on Australian Traveller’s ‘100 amazing places you haven’t been to yet‘. Nominated by: Graeme Murphy AO, choreographer, former artistic director of Sydney Dance Company. He would know; after all, Murphy is a boy from every bush town in Tassie. His parents were school teachers who were often posted to out-of-the-way places. Mathinna was a famous gold mining town with a large Chinese population in the 1800s; the tops of the doors in the many timber houses only come up to about chin height. “You can tell that at one time it was booming. It has multiple churches and general stores and I think three hotels,” says Murphy. “Now there’s a little café and that’s about it. It’s not really a place to stay, but you can visit it as part of a road trip through Tassie’s north-east,” he says. He recommends then doubling back to Launceston, and heading north to the Tamar Valley region. Turn off the highway after Legana to follow the curve of the river, and you’ll find “a hotel called Rosevears, right on the river, which is fantastic,” he says. A quick right turn past the Exeter pub and a well-signposted 10-minute drive or so through farm country takes you to Murphy’s “ultimate favourite” walk called Notley Fern Gorge (call Tamar Visitor Centre for details; 03 6394 4454). Descend into the gorge on the 30-minute return walk and you’ll find “this primordial, pristine fern gully, where tree ferns tower above and get tangled and fall over and keep growing. Next, head back to the main drag and up to Beauty Point: a tiny town close to the mouth of the Tamar, but quite high up. It has tiny, pretty sandy beaches along the river, and attractions in town such as Platypus House where you can see live platypus, and Seahorse World, a seahorse farm and breeding centre on the jetty. Murphy’s most loved spot here, though, is the local, family-run pub, the Riviera Hotel. The hotel has good, hearty food and basic accommodation, but it’s the position right on the Tamar River that gives it its main drawcard: the amazing views. If you manage all that and you’re still looking for something to see, head to Cradle Mountain, he says. 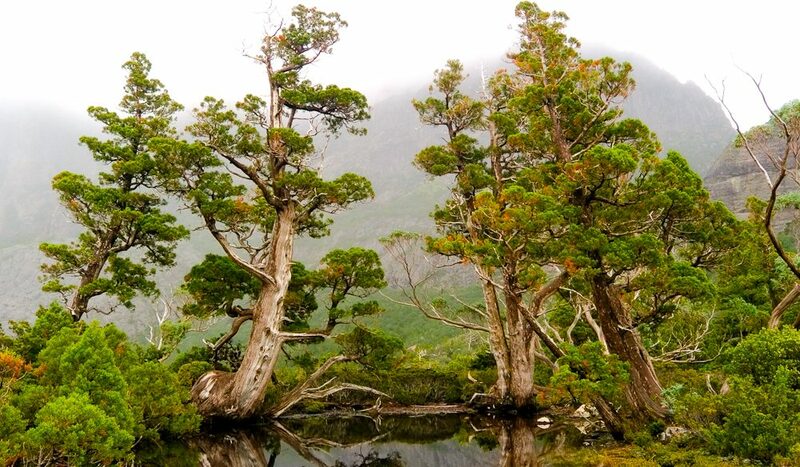 Everyone knows about the mountain itself, but not everyone knows about nearby Pine Lake – home to some of the rarest trees in the world (33 kilometres south of Deloraine). Even for a man with a true international career, Tasmania keeps beguiling Murphy. “I keep finding more places,” he agrees.